I honestly wonder sometimes if Western Civilization is worth saving. I read earlier in the week that France was refusing to honor a French police officer who gave his own life to save a woman from Muslim Terror…for fear of offending Muslims. WHAT??? In this same week, America-loving Proud Boys defend themselves (effectively) from America-hating Antifa in NYC, and Gov. Andrew “America Was Never Great” Cuomo puts out an APB on the Proud Boys! WHAT??? (Hundreds if not thousands of Trump supporters have been assaulted, insulted, beaten, banned, fired, censored, divorced, and chased out of restaurants in the past 22 months since Trump took office.) Then, also this week, there was an old friend living in California who shares the story of a friend of hers who was attacked in an elevator for being a Trump supporter. When I described the Left as having become a violent and un-hinged mob on her FB page, one of her friends took me to task, defended the indefensible, and suggested I take up gardening. WHAT??? But the week was not over. Soros Orcs hit a new low in Portland Oregon this week…when they assaulted a 9/11 Police hero’s widow. I hesitated to show you this, but we need to know the monsters. Extremely Foul Language Alert Finally, this horror scene in Denver is what our silence has invited: Extremely Foul Language Alert Anyone noticing a pattern? 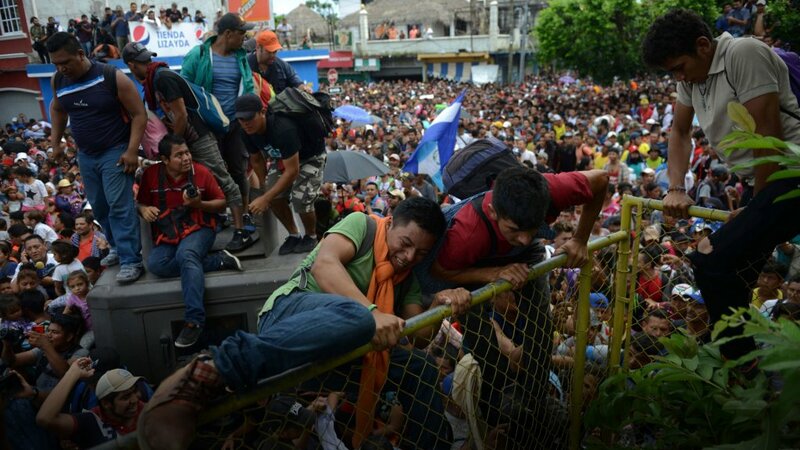 While these atrocities are occurring, our country is being invaded by thousands of UN-directed military aged males across our southern border! WHAT??? Yeah, you heard me…every word and syllable, the truth. The Globalists are collapsing the 3rd World into the West by design and malicious intent. Hundreds of Islamic Jihadis have already been discovered in the mix and detained. The question I have about any or all of these events is this: Who knows? Who cares? Are they discussing any of this around the water cooler at work…at home…in church or social events? I’m starting to see more of a discussion on Facebook, after an effort was made to redirect attention back to latest pictures of the kids, vacations, and fish caught. As a man who has always had the knack for learning his lessons the hard way, I have finally learned how to kneel to seek His will for me in a world that stopped making sense years ago. And two things have become crystal clear to me. First, I see His hand in all these terrible events through the eyes of Habakkuk. I understand the transformation of Elisha, and the parable of the buried treasure. But I also understand in the deepest fiber of my being, that I was not made to be silent, afraid, or willing to accept the unacceptable. Last week I went out one night by myself to get a bite to eat at local restaurant and happened to run into two old acquaintances, one of whom was a fairly close friend years ago. The other was not really a friend per say, but we had met over lunch a couple of times and I had helped him promote a book a few years back, and recently texted him a resource to help with his latest. The two of them, along with a friend of theirs’ were as cold as fish when I pulled up a chair. The friend awkwardly had to introduce himself. NEWSFLASH: Speaking truth boldly and unapologetically, in a culture poisoned by Political Correctness will cost you friends and opportunity. The good news is that truth is like the ultimate wheat winnower, separating grain from chaff…and opportunity from salvation. I understand the need to play it safe in times such as these. Some of us have more to lose than others. But I also understand the cost of silence and the many, as St. Catherine points out, it has killed over the centuries. And the many more here today who will not be with us tomorrow because, on the whole, we have been conditioned to become the Eloi. At least sheep know the wolf is not their friend. Finally, and I thank God for this…I am angry. But it is not the me-anger that has gripped my former friends on the Left. It is a righteous anger…the with-God-anger that empowers me. I pray you and yours to receive your heavenly dose as well. And, God willing, may it be soon. This entry was posted in Economy, Entertainment, Politics, Religion, Society, Uncategorized and tagged antifa, cuomo, invasion, jihadists, mexico, political correctness, portland, proud boys, soros, trump, un. Bookmark the permalink. CHEW on THAT today….—and tomorrow burn the phone lines down and your ‘elected representative’s EARS right off. Are you going to just give your country away WITHOUT A FIGHT? The one YOUR GRANDFATHERS DIED TO PROTECT so you could be born a free citizen ? This Deep State Hail Mary will back-fire like everything else they’ve tried since Trump got elected, but I agree we need to burn the phone lines. #MAGA! “If anyone, then, knows the good they ought to do (or say) and doesn’t do it, it is sin for them.”–James 4:17 Parenthesis mine. So many nuggets in James! 4 is one of my favorite chapters in the entire Bible…turned my life around at verse 8. Thanks Bill.